Auction Closed. Sold via Buy Now $800. Next Auction Monday Jan 28. There’s a perfectly good argument for heading south in the winter. I don’t blame anyone for trading the snow shovel and below zero temps for some Florida sunshine. But it’s hard to beat a good hunkering-down when the snow piles up. Commitments get canceled. The fridge is stocked and the woodstove crackles hot. Hopefully, the power (and pajamas) stay on. You’re not going anywhere, and nobody’s coming by. A good dog knows how to enjoy it. As usual, ours has the best seat in the house. Love this!! This is exactly what my cat Sinaya does in front of both the wood stove and pellet stove except he has a few pillow in front of each. This so so New Englandy!! Thanks for sharing your fantastic work! Absolutely you got it today Peter! 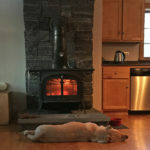 With negative 25 wind chill here in Burlington the wood stove is the place to be. Outstanding painting as always! Love this, Peter. In our home, it’s the black cat who worships at the shrine of the Vermont Castings Resolute. Our stove top steamer adds a touch of red. With ten below on the porch thermometer this morning, we’ll all be staying near the hearth. I love this! 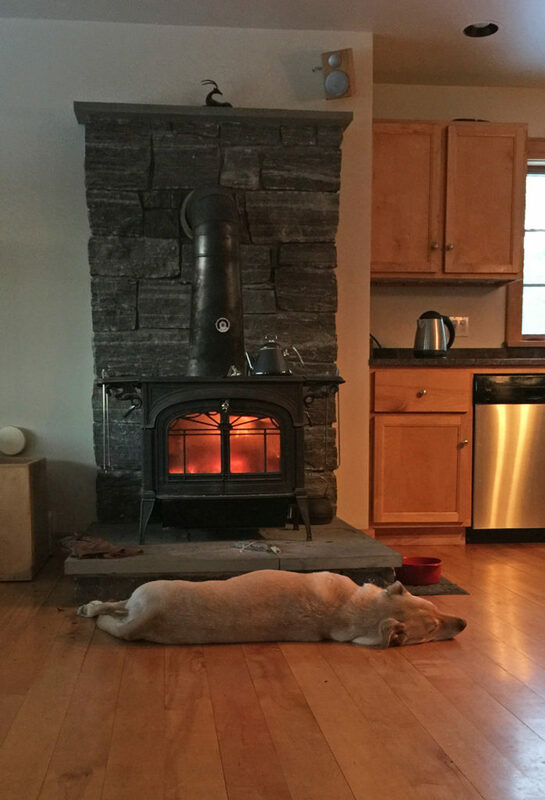 My little dog lies in front of the electric heater (that looks like your wood stove). I, too, understand folks who go south in the winter, but I like the contrasts of the seasons. Stay warm and dry, Peter. Excellent! You nailed this. Bill and I loved it. the day very cold for us 28 degrees. Will be up to 60 degrees. So a beauty of a day!! Love seeing your work. Inspiring!! Thank you! What a perfect day to post this one! Warm and cozy inside near the fire….. SO COMFY!! I feel a little warmer just looking @ your pet. Very nice diversion for a sub- zero winter day! We where in your studio last week and you said you thought you would do this painting, it is so nice, just like our dog does by the wood stove. This picture is exactly what happens at our house except now it’s a chocolate lab. Great job!! This is the way I want to spend my Winter. Snow, warm fire, cat sleeping near and just enjoy God’s beauty. 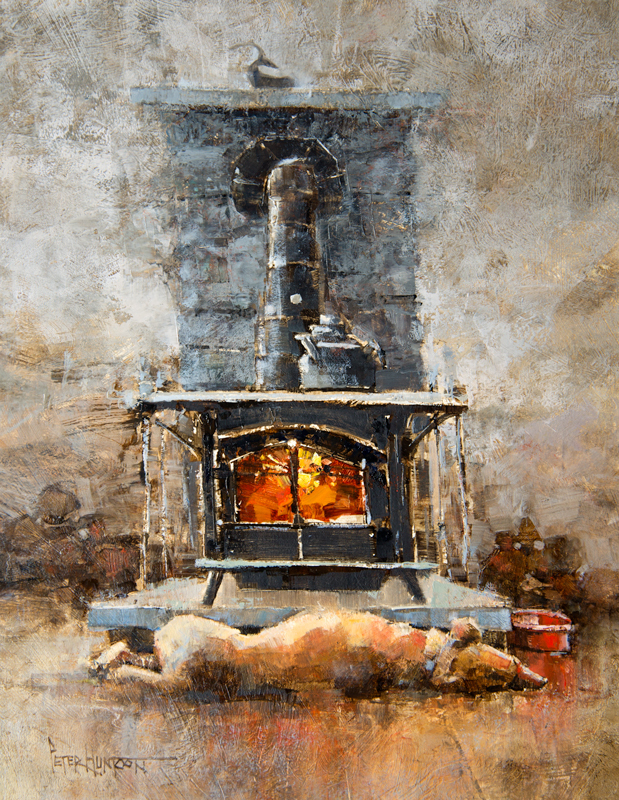 Thank you Peter for sharing your God Given Talent of painting…..
Love the subject matter…your dog looks so much like mine, as does your stove! But more than that, I love the colors, the columnal composition and the warmth of it….and always the brushwork. It has inspired me! You have snagged my heart Peter. One day I am going to own one of your pieces. My favorite to date! Something special abt this one! This painting invites one in to sit a spell, soak up some heat and pet the dog! I love it! Thank you for your beautiful artwork Peter! Awesome Peter!!! The light and warmth of this piece makes one forget about the cold outside. Love the picture, my cat enjoys our stove many nights. Thank you for the beautiful print I bought from you of the lake and it was very nice to visit your shop as well. Once again you’ve captured that inimitable canine spirit. Reminds me of my setter warming his whiskers by the woodstove until panting, he could no longer stand the heat. We lost our sweet 13 year old Golden in September but this is exactly where she would be in weather like we’re currently experiencing! A beautiful painting which brought back beautiful memories. Thank you Peter! Ah, Sweet Dreams! Very cozy! yes, this is a dogs behavior! Cats and human beings love it too. My sister has a stove like this. And nothing is more comfortable than resting in front of a heating fire in wintertime. For us with a delicious cup of tea or hot apple wine with cinnamon and sugar. Can’t help but love the joy and peace of the hearth. Warm colors and abstract composition radiate the security and comfort of a warm home fire on a cold winter’s day.